Another year, another Insta-trend. This time, to celebrate Instagram’s 10-year anniversary, they are asking people to post a 10-year-challenge: putting up a photo from 2009 and a photo from 2019. The results are what you would expect- embarrassing fashion choices, questionable hairstyles, dramatic body changes and the usual comedic memes. The UK, as well as the US and much of Europe, was in recession meaning that I was looking for a job that didn’t necessarily exist. In all honesty, I also didn’t really know what I wanted to do. I was set on pursuing a graduate scheme in retail or beauty but despite sending applications and attending a couple of interviews, nothing came to fruition. So I was stressed and felt I had hit a brick wall. My obsession with how my skin looked was just as strong then as it is now and so a simple spot would make me feel even worse about myself. One of the best things I did 4 years ago was give up most of the dairy I was consuming. Back in 2009 I was drinking skinny lattes and eating yoghurt almost on a daily basis and judging by the hormonal breakouts I was often experiencing, that dairy was only contributing to them. Dermatologists often recommend cutting out dairy if you have acne-prone skin. Why? Milk contains hormones, sugar, and in skimmed milk (like in all those skinny lattes), whey protein. Whey protein is a pro-inflammatory so if dairy doesn’t agree with you, it may be showing in your face. At the time I always felt that dermatology, particularly spots or acne, were viewed as cosmetic rather than medical. I was often embarrassed and felt insecure going to the doctor, especially if it was a male doctor and I hated the topical full strength benzoyl peroxide that used to leave my skin dry and red. My brother continuously went to the doctor with severe cystic acne (10 years ago) and was only given Roaccutane when he said his skin was making him depressed. Now that I’m older (and I’m more knowledgeable) I feel I would be able to take more proactive steps or at least a bolder approach. Social media channels and the internet are overwhelming but I think they can help in terms of the the access it gives you to specialists and there is a lot of good information available meaning that dermatology issues like blemishes, acne and rosacea are given the attention they deserve as they can be crippling for self-esteem. Get yourself some retinol and glycolic pronto! 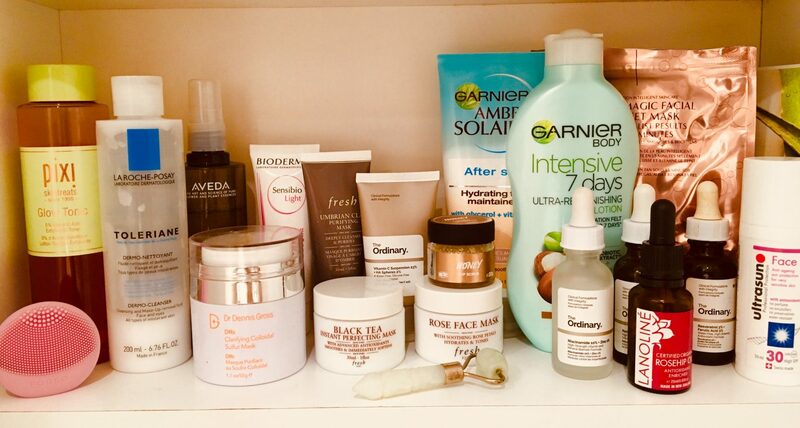 I could not live without these ingredients in my skincare routine now, so why wasn’t I using them 10 years ago? They would have made such a difference in terms of skin texture and clarity. Back then (considering I had so much access at SpaceNK) I wasn’t doing my skin product homework in the same way I do now. I was focused on salicylic acid but probably could have avoided more fragranced products- St Ives Blemish Fighting Apricot Scrub anyone?! So to my 22-year-old self: Don’t worry: you’ll figure out the skin thing, you’re going to meet your husband next year and the work will come.